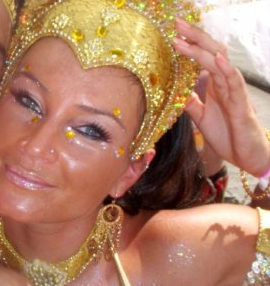 I asked my friend Nina to share some of her carnival makeup tips on applying makeup that lasts all day. ... And I added my two pence here and there ... 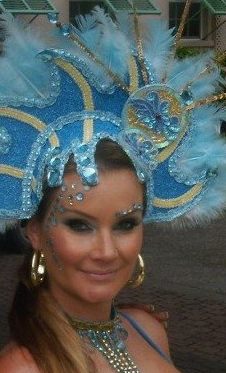 I hope it makes life easier and gives you your best face for Carnivals 2011! Also ladies, with all the talk about makeup appointments with makeup artists, I just want to let you know that some of us, like Nina and I, do our makeup ourselves. ... And you can too! 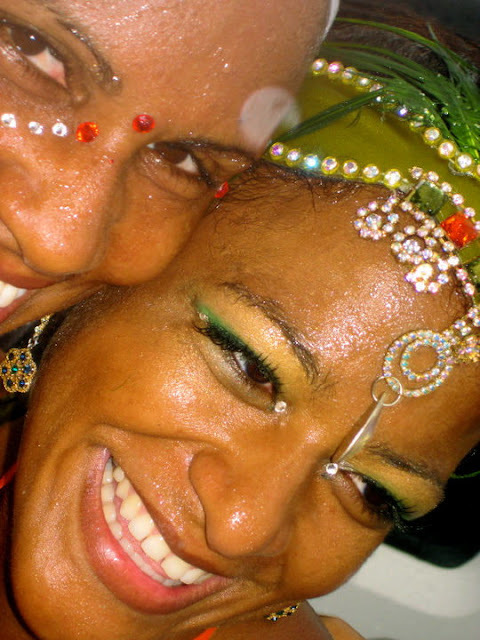 Carnival, Bacchanal: beautiful people with amazing bodies in breath taking costumes. 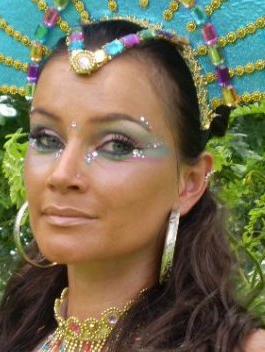 Gorgeous female revelers with stunning curves and of course, make-up! 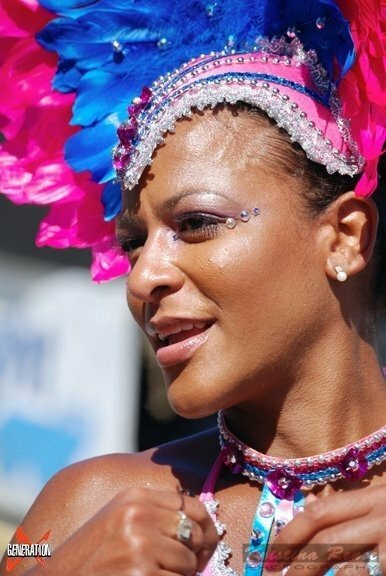 Ranging from colorful and extravagant to simply just emphasizing your natural beauty, make-up is definitely for most women a part of their transformation into a carnival goddess. If it is to create the illusion of a flawless silky smooth skin with a slight glow or to transform your face into a piece of art in all colors of the rainbow using liners, shadows, glitter, rhinestones…one thing is important: IT NEEDS TO STAY WHERE YOU APPLIED IT. There is no point spending your dollars on false lashes and sparkly crystals if they are lying on the streets of POS, Bridgetown or Miami after 30 minutes. It is necessary to create the right “canvas” to paint on. Wash your face with a mild face gel or foam and use toner that does not contain alcohol. In general I would avoid all face products with alcohol during carnival because your skin is exposed to bright sunlight and it might cause discolorations. The toner will remove all the oil from your face. Followed with a primer, to create a smoother surface. * If you have a oily T-zone like me (which bothers me, showing up in almost all my pictures) you should use an anti-shine primer, one little drop is usually enough because you do not want to clog your pores. In case your primer does not have an SPF please use sun protection before you continue with your foundation and concealer. I do not have a preferred method on applying foundation … feel free to use a brush, sponge or even your fingers before you set it with your powder. *Sweet 7: A light dusting of translucent powder before your foundation helps to hide pores and fine lines for a smoother-looking canvas. Now let your creativity flow with colors that complement your costume. 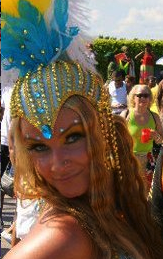 * Remember during carnival you can be brave and wear intense colors and designs you wouldn’t dare wear in the club. *Sweet 7: A Color Wheel is beneficial ... when playing with color! May it be for making up your face, fashion, or decorating your home. Learn the basics. Complementary colors are colors that fall directly across, opposite from each other on the color wheel. Examples of this are red and green, blue and orange, and yellow and purple. For false eye lash application make sure you allow the glue to get sticky* before you put them on so they will stay in place quicker and last much longer. *Sweet 7: Like Nina, I love falsies. I'd wear them every day, if given the chance. I recommend using DUO Ardell EyeLash Adhesive. Only suggestion don't do the bat wing eyelashes. From my experience, the year I did, it rained and they just drooped over my eyes. Then I was blind as a bat! To stick your rhinestones I suggest tweezers and a good quality lash glue. * For areas away from your eyes, use a liquid body glue. Please DO NOT use body glue on your face if you have sensitive skin and really nowhere close to your eyes even if you have normal skin. Body glue on your face will makes eyes teary and all your liner and mascara will run! I speak from experience. *Sweet 7: Instead of eyelash glue, I recommend spirit gum, especially for those who either sweat a lot, have oily skin or just in case it rains! Once you are happy with your design you can spray some setting spray on or touch it up with your powder before heading out. I heard of people using micro hair spray* but I have never tried it and it sounds weird so I won’t suggest it. *Sweet 7: Don't try anything crazy the day of carnival if you've never done it before. A face of hives or red blisters would not be cute. After a 14 hour jump up, chances are to look fresh as in the morning when we meet band trucks is really small. The flat belly is full of drinks and maybe roadside snacks. The hair might be a bit tangle and dishevelled. Yet, it is definitely possible to preserve the beauty of the decorated carnival face for hours longer, if you follow the above noted steps. 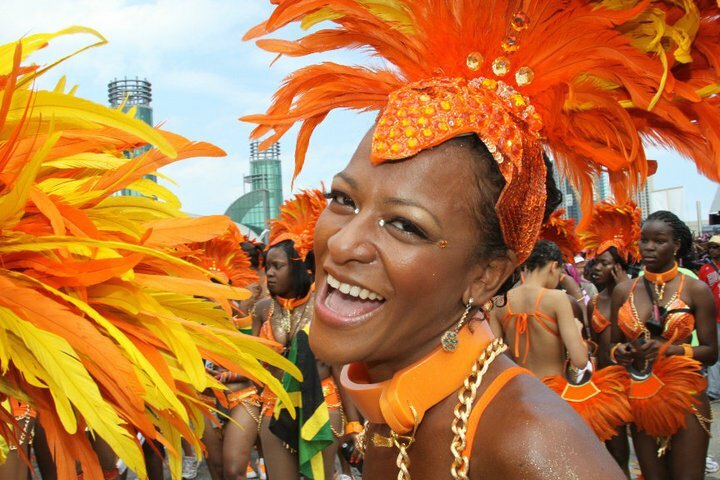 Cheers to Carnival and Caribbean life! More pictures of Nina ... I always love her makeup! Sweet 7 pictures ... I go for a rather simple face! Jahnna so true ... I had the same prob in SLU last year. LOL! Hence the pic of me in green ... all wet! LOL!